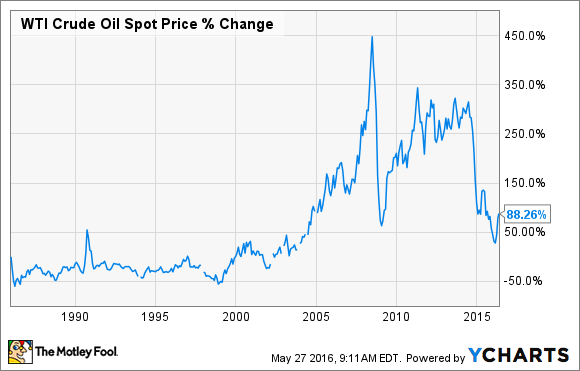 Investing in oil stocks isn’t for everyone. The oil crash over the past couple of years has wiped out a whopping $1 trillion of equity from oil stock investments, leaving investors feeling burned. That has caused a lot of ill will toward the sector, and for good reason, because the sector itself can be blamed for at least some of its failings. 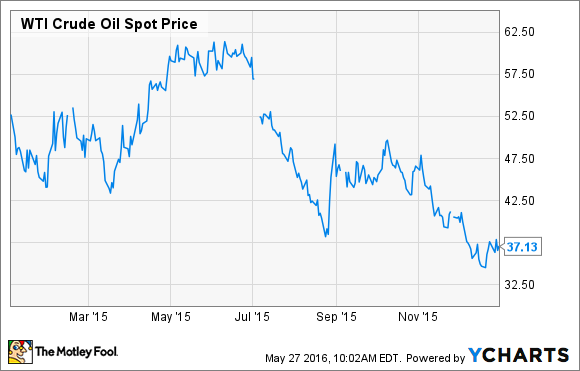 Needless to say, there are plenty of reasons why investors might hate oil stocks. That volatility is really hard for the average investor to stomach, because most turn to the sector in search of income and to hedge against rising energy costs. Instead, they've been taken on a roller-coaster ride with almost nothing to show for it. It costs a lot of money to develop oil projects. That capital intensity forces producers to borrow heavily to fund these investments, which can cause problems when oil prices collapse. That's just what we've seen over the past year after a rash of bankruptcies hit the sector. Through April, 69 producers have filed for bankruptcy under the crushing weight of $34.3 billion in debt. More bankruptcies are likely on the way, with Deloitte estimating that about a third of the sector, or roughly 175 companies, are at risk of insolvency. Meanwhile, Bernstein Research estimates that more than $70 billion in debt will be defaulted on by 2019, which is a huge chunk of the $400 billion high-yield energy debt market. While oil doesn't have the environmental impact of coal, it's still a dirty fuel. Greenhouse gas emissions start at the drilling rig, continue on through the refining process, are spewed out during transportation, and continue out through the tail pipe of a car. According to the EPA, oil and gas production was second only to coal power plants as the worst emitters of carbon-dioxide equivalents. Not only is oil bad for the environment, but it is a dangerous fuel. There have been a number of notable disasters over the years where lives have been lost, most notably the 2010 BP (NYSE:BP) Deepwater Horizon tragedy, in which 11 people died when an underwater blowout caused an explosion on the drilling rig. Even more recently, 13 were killed when a helicopter crashed while servicing an offshore oil field in Norway. Because crude is a dirty and dangerous fuel, its transportation must be handled with care. Unfortunately, the industry has had a number of transportation disasters over the years. One of the most horrific was the Lac-Megantic disaster in 2013, when an unattended 74-car train carrying oil derailed and exploded, killing 47 and destroying the town's center. Meanwhile, there have been a number of oil pipeline spills, including last year's Refugio oil spill in California. In that incident a 28-year-old pipeline owned by Plains All American Pipeline (NYSE:PAA) leaked an estimated 142,800 gallons of oil onto one of the most biologically diverse coastlines of the West Coast, coating hundreds of animals with oil. In late 2013 the Bureau of Labor Statistics estimated that the oil sector would create another 1.1 million jobs by the end of this decade, due to the oil boom in the U.S. Two years later the industry has shed an estimated 118,000 jobs, causing more than one in every five oil workers to lose their jobs since crude crashed. It's causing former boom towns from North Dakota to Texas to go bust. That's after factors such as resilient shale production, the reentry of Iran to the oil market, and quota-busting production from OPEC caused the glut of crude in the market to grow worse, weighing heavily on its price. When times are good, oil companies are flush with cash. Some of that cash is sent back to investors via dividends, with oil companies typically paying much higher dividends than other sectors. However, when times are tough these dividends are often the first cuts producers make, because they need that cash to pay down debt or invest in oil projects just to maintain their production. So far this year investors have lost a whopping $7.4 billion of income after companies like ConocoPhillips (NYSE:COP) slashed their payouts to conserve cash, with ConocoPhillips cutting its payout by $2.2 billion. While the U.S. is a top-three global oil producer, the country still only produces about 10% of total global supplies and about half of its own consumption. As such, it needs to turn to less-than-ideal places to meet its needs. In fact, the bulk of the world's oil is either produced in geopolitically unfriendly places, like Russia and Iran, or in geopolitically unstable places like Iraq, Venezuela, Nigeria, and Libya. Further, the bulk of the easy-to-access oil has been depleted, which has forced producers to go searching for oil in difficult-to-reach areas such as deepwater fields and the Arctic. One of the reasons the price of oil has been under so much pressure over the past two years is that oil companies keep producing more oil even when the market doesn't need the supplies. That's partially because many oil CEOs are paid to drill. Chesapeake Energy's (NYSE:CHK) CEO Doug Lawler, for example, was paid $14.7 million last year, which is up 5% over the prior year. That's despite the facts that the company's stock plunged 77.2%, it suspended its dividend, and it issued thousands of pink slips. This production push was due in part to Chesapeake Energy's compensation plan, with the company's management team being incentivized to drill new wells in order to grow the company's production and reserves. That pursuit of growth at all costs led the company to nearly burn through its entire $4 billion cash position, putting it in a very precarious financial position that sparked rumors it could file for bankruptcy. Oil stocks are not for everyone. For some, the volatility, lack of clarity, high leverage, and misaligned management incentives are reason enough to avoid investing in the sector. For others, it's the fact that oil is a dirty and dangerous business that make it unfit for their portfolios. That's OK: there are plenty of other options for investors who don't want any oil holdings, especially after the sector has given them so many reasons to hate it.